R is for Ronnebeck! : Being 17 again! I really hated everything about being a teenager. I didn’t have anything that I really “fit in” to. I was constantly trying to be part of the popular crowd; I wasn’t “popular material”. I tried my hand at being a rebel and a druggie; but I didn’t want to break rules or try drugs. For a short time I dreamed of being a cheerleader; I had a lot of school spirit, but I wasn’t very graceful. I wasn’t smart enough to be a smart kid, or dumb enough to be a dumb kid. I just kind of floated through Jr. & Sr. High as a nobody. I had my friends, and we had fun, but I was always trying to fit myself into a little crevice that made me “Somebody”. In the 11th grade I was leaving my sociology class I accidentally bumped into one of the popular senior girls, I fell (remember, I’m not very graceful), and scattered my books and papers all over the floor ( I was anti-backpack in 11th grade, it wasn’t “cool”). The girl, in a very high school kind of way told me to “watch where I was going”. The Quarter back of the football team, [who was one hot ticket in High School] came around the corner, and I will forever remember him helping me collect my things while the girl continued on her way; and I drew hearts around his name for weeks. I am ready to turn on the cheese – hope you’re ready to eat it! I think being a “no body” in High School really made me grasp on to the Twilight Series when I finally caught on to the phenomenon. I really do love these books, and I know they’re meant for ‘young adult’ readers, and I know I’m a total nerd for blogging about it, but my 17 year old self could totally relate to the craziness that is Bella Swan and her love life, high school adventures and over exaggerated problems; it makes my 26 year old self swoon. Next week the 3rd movie ‘Eclipse’ comes out in theaters on Wednesday. I will not be seeing it for quite some time, because I know there’s a whole lot of actual 17 yr olds (and younger) that want to go to squeal when Jacob Black removes his shirt for the first time, and that just drives me batty. In honor of these movies not being as good as the books, but more so in honor of the books themselves, and the inspiration from my co-worker Mindy (you can blame her later) I am pimping Seattleites ‘Eclipse’ style! 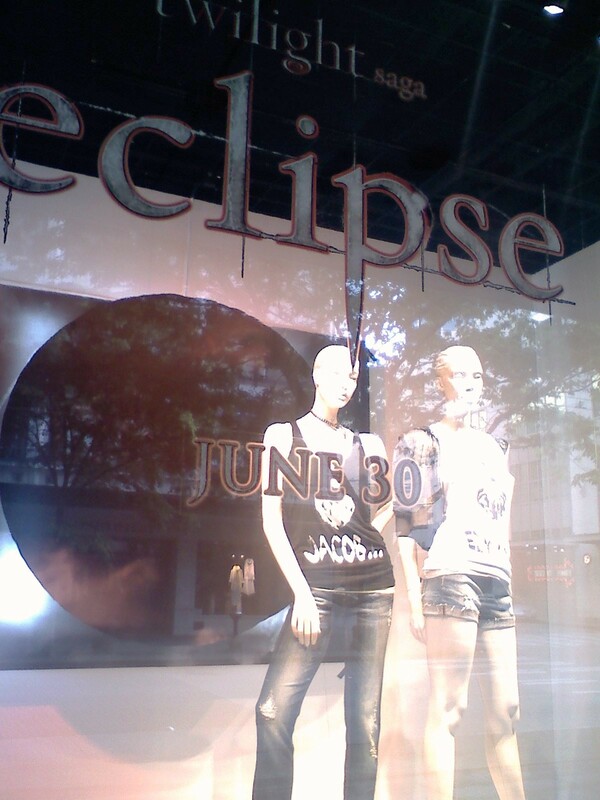 I figure if Nordstrom down town can pimp one of their store windows and rock the I heart Jacob … I heart Edward tee shirts, I can do the blog! Oh, and if you think I’m crazy for doing this… check out people who are tracing Robert Pattison’s (Edward) and Stephanie Meyers’ (author) genealogy to Dracula!! !